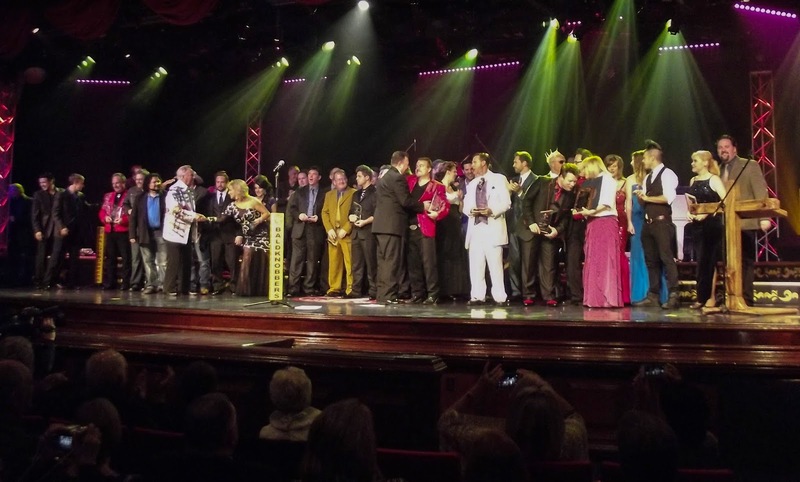 Not often are so many of Branson's entertainers in the same place as they were this past Sunday. The occasion was the Branson Terry Music Awards at the Baldknobber Theatre. There was music, laughter, tears and did we mention laughter? It was one humdinger of a show! As Terry Beene (President-Founder BTMA) said in the show program, it included the “best of the best.” Everywhere I looked there were familiar faces, friends and celebrities. Masters of Ceremonies were music superstar Billy Dean and the entertaining Chuck Hancock. All was forgiven quickly as he sang his hit song, BillyThe Kid. He and his Steel Horses Band sounded fantastic. His next song was very patriotic and showed that he is definitely a good fit for Branson. 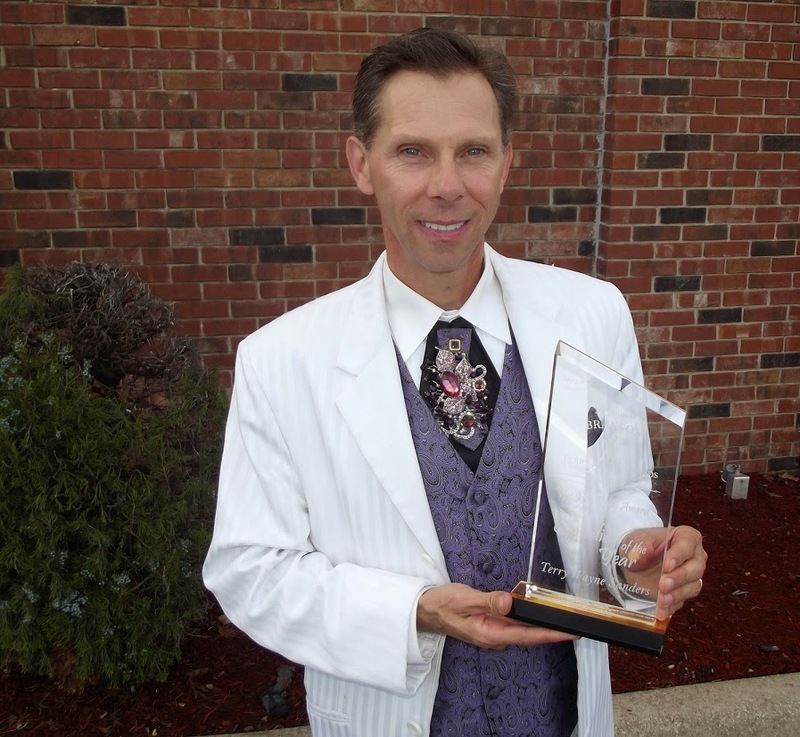 Branson's Tour Guide's Terry WayneSanders won the first big award of the day as Comedian of the Year. The crowd went wild in agreement with this choice. Terry dazzled in an all white suit with purple vest and his customary good humor. Barbara Fairchild's speech and emotion as she received the Co-Humanitarian of the Year Award in here in Branson as well as a special Proclamation from the Gov. of Hawaii. I love her humor and heart for God. Randy Plummer winning the Lifetime Achievement Award. It couldn't have happened to a better guy. I liked seeing the genuine tears of joy on the face of C.J. Newsom as her show, Patsy Cline Remembered won the Matinee Show of the Year. However my favorite moment of the afternoon occurred when Chisai Childs went into the crowd to hand deliver the Co-Humanitarian of the Year Award to Paul Bluto ofBranson's IMAX Entertainment Complex. In typical Paul Bluto fashion, he wouldn't hear anything of it! Instead, he chose to inspire us once again by walking up on stage. I would dare say that Paul Bluto has positively touched more lives in Branson, MO than just about anyone else – including mine. He has a true heart for helping others. All-in-all it was a very good day to be in Branson at the Beautiful Baldknobber Theatre. If you missed this year's show, there are already plans in the works for next year. Stay tuned to Branson's Tour Guide for all of the details. After you look at the pictures below, be sure to see our Facebook page for even more. Also, for a complete list of winners please please go to the bottom of this post. NOTE: If you were a winner and do not see your photo here, this was completely unintentional. We do however have other pictures that we will be posting in coming days so please check back. If you would like to submit a picture please send us a message on Facebook and we will be more than happy to help.